For the quirky girl who loves to make a statement. 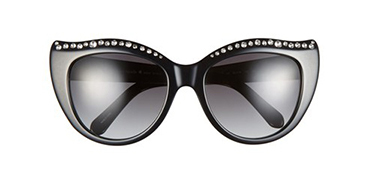 Kate Spade sunglasses and eyeglasses keep any girl looking her very best with her soft feminine styles. Her eyeglasses give off the career driven look, but they’re still stylish. Kate Spade fashions and eyewear collections leaped the NYC runways and onto the street style looks in 1996. With her first boutique opening in New York City she changed the way we wear our simple outfits. She adds a mixture of fun, elegance, and luxury along with any pair of sunglasses & eyeglasses. 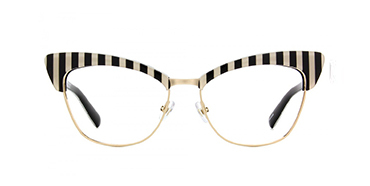 Only the coolest designs and classic shapes are showcased on each pair of Kate Spade eyeglasses. Her speciality is how her reading glasses give any girl that sharp sophisticated look. Indeed you’ll find her signature Kate Spade name and the spade symbol stamped on each side. Her love for oversized rectangle shapes, & smooth aviators styles. Yet her cat-eye styles are the must-have sunglasses to strut in for any season. Overall her sunglasses create a sense of playfulness with prints and striking colors.